On Tuesday, the Republican Party released its 2012 party platform, a 62-page, 32,000-word treatise on its agenda, which includes priorities such as reconsidering a return to the gold standard, bringing back Don’t Ask, Don’t Tell, and ignoring climate change. 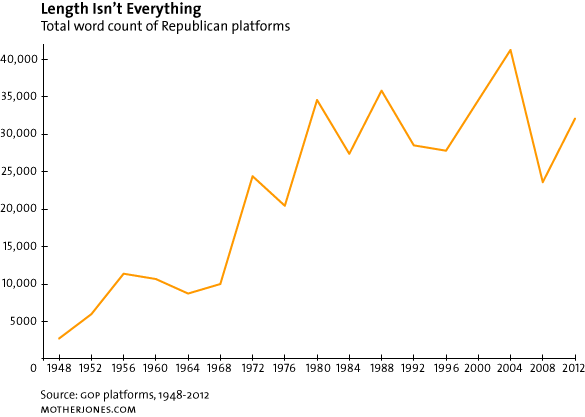 Platforms are getting longer: The 1948 GOP platform clocked in at a tidy 2,739 words. By 2004, it had bloated to more than 41,000 words. This year’s is a little slimmer, but it’s hardly a quick read. 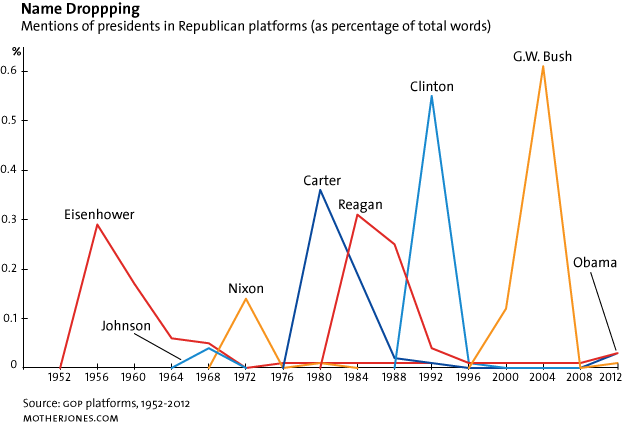 Heroes and foes come and go: George W. Bush has received more love (relative to the length of party platforms) than even Ronald Reagan, yet he went from being mentioned 250 times in 2000 to being mentioned 3 times in passing this year. Bill Clinton and Jimmy Carter have been popular bogeymen. Barack Obama, however, is mentioned only 9 times this year, usually in the phrase “Obamacare.” Reagan is also mentioned 9 times this year. 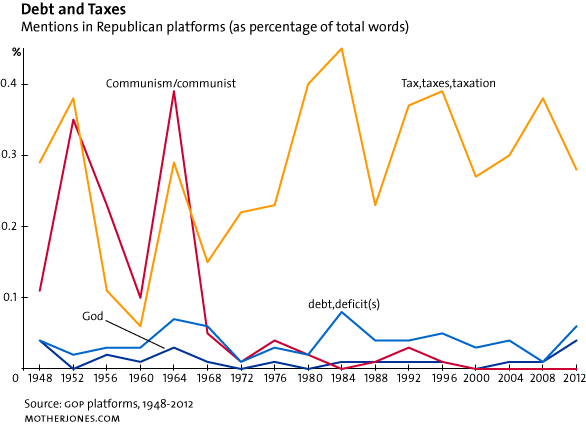 Complaning about taxes never grows old: The Republican party seems more tax-obsessed than ever, yet unfair taxation has been a constant theme in its platforms for decades. Debt and God also get regular mentions. Communism, once a top international and domestic concern, is all but forgotten.